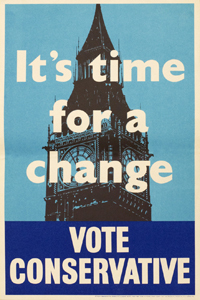 Chris Burgess, a fellow political advertising enthusiast and academic at The University of Nottingham, has accomplished the staggering task of putting on an exhibition of historic political posters. If you’re anywhere near Manchester before June 2012, get down to the People’s History Museum for a gander. Chris is also writing a PhD on the topic, but has kindly summarised 10 things that he has learnt from his analysis of political posters through the ages thus far:. 1. British politics is as much about what we see as about what we hear. 2. There is ‘language’ of posters. Poster designers rely on the voter to understand a number of symbols and words. These symbols – like the pipe – drop in and out of favour. Some like the sun remain. 3. Poster design changes, but there is no systematic development. As a result, some posters look older than they actually are, and some relatively ancient examples have the look of something produced yesterday. 4. Political posters are ephemeral and transient. They aim to speak to a particular electorate from a specific election.Most are forgotten as quickly as they are produced. 5. If the job of Prime Minister’s is becoming increasingly ‘presidential’, it is because the diminishing power of Cabinet and Parliamentary scrutiny, not because leaders are promoted differently. The ‘presidential’ Prime Minister began in 1929 when Labour, the Conservatives and the Liberals promoted their leaders above their parties. Even before this point, parties understood the electoral benefit of a popular leader. 6. The vitriolic attacks on Asquith, Chamberlain and the House of Lords before 1914 show that politics has long been ‘personal’. 7. Even after they won the vote on equal terms as men in 1928 the parties appealed to them not as individuals but as mothers and as holders of the domestic budget. I have only found two posters which appeal to female voters as workers. 8. Despite feminism, parties remain convinced that women should be appealed to in ‘special’ ways. 9. Posters can be the place where art and politics meet, although not always. 10. Posters aren’t static transmitters of information. They form a vibrant public politics of the street and, since 2010, the web. If posters are a throwback to the 19th century, they are the continued hurrah of Victorian politics: they remain vital to how the parties try to communicate with the people. #8 is a good point in particular. One of the oddities about the way both politicians and political scientists often talk about about British elections is that female voters are described as if they are a minority, when in fact of course they are the majority – and if you are going to talk about a group of voters as being different from the norm, it should be male voters, as they are the minority. Hi Mark, yes I completely agree. The body language towards ‘the female vote’ always seems as if it’s a nice-to-have, rather than the majority of the electorate. Benedict.